Tickets available online CLICK HERE, and at the Salmon Arm Folk Music Society office. It was at the 2014 ROOTS&BLUES Festival when Cannery Row showed Salmon Arm audiences what an outstanding and diverse ensemble they are. At a Sunday night Boogie Bar-N concert, and multiple workshops that included memorable contributions to the Positively Fourth Street session, Gary Comeau, Tim Hearsay and Chris Nordquist rocked our site with a blend of Cajun/bayou, blues, and swing sounds that were embraced by roots music fans of all ages. As exuberant as they are talented, Cannery Row bring a joyous feel and attitude to everything they sink their musical teeth into. Longtime veterans of the Vancouver music scene, Comeau was on the frontline of the country-rock hit makers Blue Northern in the eighties with Billy Cowsill and Ray O’Toole, Nordquist has played his drum kit behind everyone from Jim Byrnes to Colin James and countless touring blues legends, while Hearsay stands as one of the tastiest roots bound guitarists on the scene today. 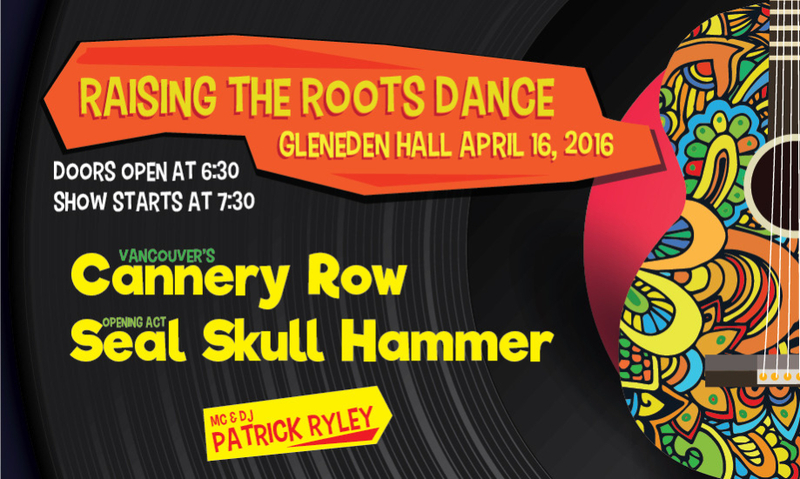 Dance floors are a must once Cannery Row starts playing which makes the band a perfect choice for our Raise The Roots bash on Saturday April 16 where the group, which is coming this time around as a quartet, will serve up two lengthy sets. Also on hand, our ROOTS&BLUES musical mascots and Shuswap faves Seal, Skull, Hammer, wh0 will be kicking the evening off with material from their recorded releases. Look for Patrick Ryley of EZ Rock to keep the dance floor happening between acts via his dj skills and rapid fire, hilarious patter and asides. Full bar, food and snacks, a silent auction, your best friends and next door neighbors…….what more could you want as ROOTS&BLUES starts the countdown to the 24th edition of the best festival in the interior.